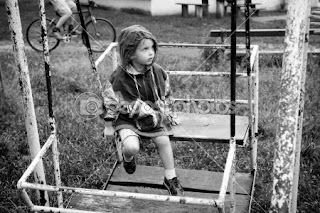 There are times still when I am struggling emotionally I sometimes reflect back to a period in the mid 1960's where I would be on a swing alone at one of my friends house. I can even recall pretty vividly that particular day. It was a fall like day, I was wearing shorts, had short hair, the trees surrounding me and what direction I was facing on the swing. When I am struggling emotionally, I will call up that day in my mind and tell little JBR "you can wake up now." Meaning I never left that point and time. I am back there. I just drifted into the future. I cherished that day and time as a peaceful and safe place that I did not want to leave. When I was actually there on that day, I remember even thinking, as young child of seven or eight, this would be a place in my mind I could always come back to and feel safe. Something like that. But there was a "BUT." A big "BUT." At this safe place when I would bring up this memory of being actually back there as a child, I would recall as a child and have the opportunity to advance 40 years into the future. Confused yet? Taking one painful year at a time. Seeing how my life became. I went off to this place many times as a child and early teens. Finding myself as an adult still going there, but not as frequent as I had other avenues to use for safety (i.e. la-la land). When I catch myself still now seeking this peaceful time, it is usually when I am under a lot of emotional stress. Disappointed that I am not physically present as a child on that swing when reality hits me once again. Okay, why did I share this? I have always tried to explain this important focal point to my first t. and she did not get it. So I gave up. But for some reason, here comes my "Spirit" urging me on to try once again to share. And to share with you all. So, in re-reading this entry, I come close to explaining the feelings I was experiencing and the peacefulness (something I have not had in ages) inside me. Though writing the emotion and experiencing the emotion in my mind and heart are two different things. In essence this is where I went to be safe. It is good to have a safe place to go to, a place of peace and happy memories. I believe it is good for the mind, heart and soul. As long as you don't get lost there. This sounds like a wonderful, peaceful place and I praise God you have had this spot to venture to when things were rough for you. You are such a blessing JBR, I really want you to know that. I get it JBR!! I too go to my 'safe' memories and places when I meditate now. I new skill I wish I had had 40 years ago. It gets me through my rough emotional times. Don't understand why a 't' wouldn't, but then again by son has had some that were disappointingly a waste of time because they either didn't have any 'life experience' or enough empathy or desire to understanding. Sadly 't' are only human and usually go into that field because they have their own issues in which they want to understand. I hope the current 't' understands too!! you should go to a park, take a picture of a swing and write all emotions that enter your mind. more proof that God was taking care of you back then. :-) I didn't realize that it was Him back then watching over me. I know it now and I find such solace in that. I hope you do too. I get it! I have that place too . . . it's a place where I experienced the FULLNESS of God. I have realized that that experience is not isolated to that place in time . . . He is with me ALWAYS. Loved this post sister! Very interesting. I think it is awesome if you can actually go there in your mind. When I am hurting I usually only stay in the bad place going over and over it in my mind. I wish I could go to your swing and find peace. I'm glad you have a "safe haven" to go to when things get rough. God bless you, JBR! I'm praying for you! I pray the Lord give you peace today. Hi JBR. Long time no see. Took some time to remember your blog address. checking in on you and hope your doing good. YOUR PLACE AND MY PLACE ARE ALMOST THE SAME. I HAD A FAV CHAIR I WOULD SIT IN AND FEEL AT PEACE. ESPECIALLY AFTER MY MOTHER WOULD YELL AND BEAT ME. I WOULD GO TO MY CHAIR WITH MY WHITE BEAR AND CUDDLE. THIS POST I RELATE TO JBR. THANKS FOR BEING BRAVE IN EXPLAINING THE BEST YOU COULD ABOUT YOUR SAFE ZONE. JBR when I read about your swing I thought of you regressing to behaviors too young for the stage of development you've already achieved. You went to that swing for comfort. What ever was happening at home that you didn't like or couldn't handle as a child you went to a safe place. Your swing. I marvel how the human mind can find safe zone in order to survive. You're a survivor JBR! God Bless. JBR, it's wonderful to have an image or memory of a peaceful place where you felt safe, and it makes a lot of sense that you would go there in your mind under stress. I wonder why your first T didn't understand? I think it's wonderful that you have a "place" like that that you can go to. That's truly a blessing. Use it to your advantage! Escapism is fine, as long as it doesn't turn into avoidance. My place is in my bed as a child with freshly washed sheets on a summer night. I can actually smell the scents of the bleach on the sheets and lilac tree outside of my window. My therapist helped me find this memory this year. A lovely refuge in a place and time you felt safe! I don't blame you for going back to view more threatening or fearful parts of your life. We should all have a safe place to go to like that. Sometimes the world feels 'unsafe' and the comfort and peace that our safe place offers is inviting. Sharing your thoughts and praying for you. Would you ever consider going back to another one? I'm sending so much love your way! Blessings.